Sir Alfred Joseph Hitchcock was born on the 13th of August, 1899. He was an English film director and producer. He is often referred to as the "Master of Suspense" because he was one of the first film makers to introduce the elements of the suspense and psychological thriller genres in cinema. He first started making successful silent films and early talkies in Britain and became renowned as England's best director. 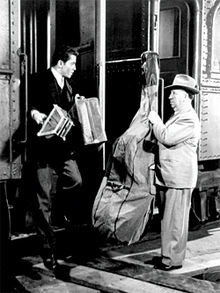 Then, Hitchcock moved to Hollywood in 1939, and became a U.S. citizen in 1955. Hitchcock became a highly visible public figure through interviews, film trailers, and the ten years in which he hosted the television program Alfred Hitchcock Presents (1955–1965). He also made brief appearances, technically called cameo appearances, in his own films. For example, he is seen struggling to get a double bass onto a train (Strangers on a Train), walking dogs out of a pet shop (The Birds), fixing a neighbour's clock (Rear Window), as a shadow (Family Plot), sitting at a table in a photograph (Dial M for Murder), and missing a bus (North by Northwest). Hitchcock also created for himself a distinguishable directorial style. The term Hitchcockian is now often used to designate his style of film making. Hitchcock's stylistic trademarks include the use of camera movement that mimics a person's gaze, forcing viewers to engage in a form of voyeurism. In addition, he framed shots to maximize anxiety, fear, or empathy, and used innovative forms of film editing. His work often features fugitives on the run alongside "icy blonde" female characters. He often portrays characters with psychological problems. For instance, some of his films feature characters struggling in their relationships with their mothers. Hitchcock is now recognized as one of the most influential directors in the the history of cinema. He directed more than fifty feature films in a career spanning six decades. His first thriller, The Lodger: A Story of the London Fog (1927), helped shape the thriller genre in film. His 1929 film, Blackmail, is often cited as the first British sound feature film, while Rear Window (1954), Vertigo (1958), North by Northwest (1959) and Psycho (1960) are regularly ranked among the greatest films of all time. 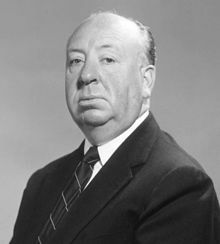 Hitchcock died aged 80 in his Bel Air home of renal failure on 29 April 1980. Hitchcock used to appear briefly in most of his films. Hitchcock was interested in the psychology of his characters. Hitchcock's career as a film maker lasted for sixty years.